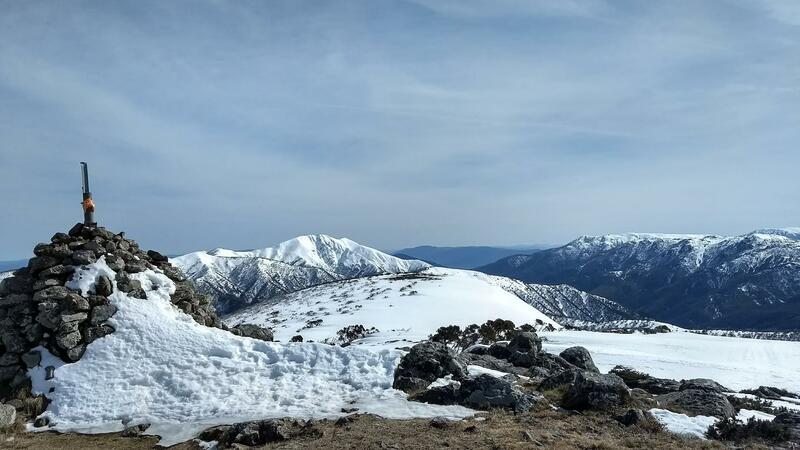 Snowshoed across from Hotham to Falls a few weeks ago, 22-23 September, taking the route as described inthis thread. Hike out of dibbins was horrible, took me 3 hrs to walk the 2ks up onto the high plains, snow was very soft in the afternoon sun, knackering work. Tawonga hut has a bad chimney on the fireplace, the hut fills with smoke. Snow cover was very good, full coverage except for about half a k either side of Dibbins hut. Parked in Bright, got the bus up to hotham on Friday morning, then hitched back to bright from falls, didn't take long to get a lift. This was probably the best photo location, up on Mt Loch near Hotham, I took a streetview style photo up here but it corrupted. Note that the snow cover was better than this image makes it seem, i think the wind destroys the snow cover on the summit. Great pics and looks like the weather was on your side. I have only been able to do those sites during the non winter months.